Perched in this restaurant vacant neighborhood, a burger meets Tiki bar promises grand delights, though its deliverance is marred by simple- yet fixable dilemmas. The atmosphere is pleasant and vocational, white-washed stressed windows slung open over simple retro-style seating, giving the feeling that you’re lounging hammock-wrapped in Jamaica or some other exotic locale-while listening to the likes of Norah Jones and Dean Martin. Memorabilia of a food culture past shines, old Heinz ketchup signs, Coca Cola trinkets and a ham-fisted name play sign “EnJoy”- sparingly highlight the walls. The style is bright and fun, unlike the Joy Burger team, who are clad in saggy, uncomfortable blue overalls while donning belittling red conductor style hats – unfortunately their moods match the color of their garb: Blue. Lazily a staffer gives me a playing card, symbolizing the marker for my order-and grunts, “We’ll call ya.” I admired the images on the wall as I was shunned away to my table.Israeli born owner, Roy Ben-Jacob, shows his painstaking chore- transforming his vision from a bodega/grocery store into a hopeful burger emporium. I can’t help but feel that the Joy that is sold through the name, just doesn’t shine through in the people that work there. Despite my differences with the help, the menu is full of spice and variety. Burgers come in Munch 3oz [$3.50]; Midi 5oz. [$4.75] and Maxi 8oz. [$5.95] and can be slathered with an available bounty of condiments such as, garlic mayo, chimichurri and spicy mango. The Munch I ordered was the pick of the litter. Dolloped with an earthy chimichurri and ribbons of onions- it was juicy and delightful to the end. On contrast, the Midi and Maxi’s were dull and chewy. 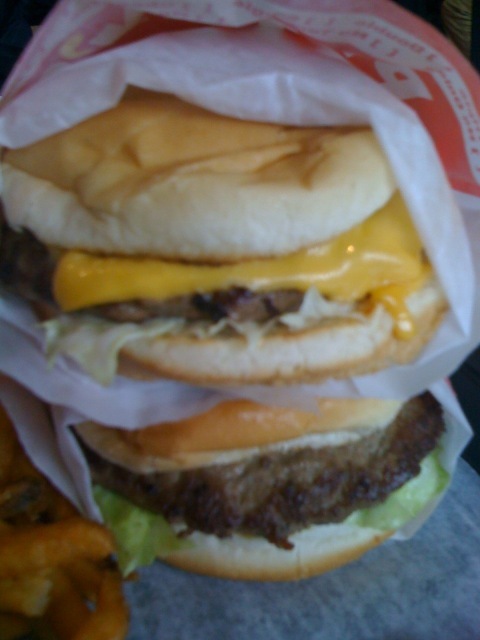 The Midi I chose with a spicy mayo, was light and zesty, but the meat was gnaw-worthy and grisly. The Maxi reminded me of a suped up Whopper, and was too big for the bun. It was toasted perfectly, but it wasn’t enough to save the over-sized meaty matter-it was unsuccessfully housing. When visiting Joy Burger Bar, stick with the Munch and couple it with the chimichurri and a helping of over-sized crispy onion rings- which one of the despondent Joy burger assembly line obviously found a little Joy in preparing. This truck stop diner-style slop house, nestled in a strip mall, claims to have “The Worlds Famous Hot dog”-but how’s the burger? A black and white checkered bathroom tile plasters the counter where a herd of good ole’ boys sporting John Deere hats with lower-lips full of tobacco greet you-or should I say -growl at you. The fare mainly is hot dogs, burgers, fries, typical breakfast combos. Tankards of beer are available for the thirsty, or alternatively, you can select a beverage from the “Cold Beverage Center”. It consists of a banged up commercial sized refrigerator packed with Sam’s Corner Mineral water, Grape Nehi and Yoo-Hoo-that watered down chocolate nightmare. Amateur food charactertures are hung on the plywood sided walls, along with gaudy neon signs and a “Try our brains and eggs” placard. Littered around the room are cigarette machines, video casino games and fake Tattoo dispensers. Perched on the counter is a neatly packed mini- bottle liquor cabinet to grog the golfers and the mostly retired folk that drift through these doors.After ordering from the counter, take a seat in bright red laminate benches where a selection of condiments are available table side including Heinz57, A1 and Malt Vinegar. The griddled cheeseburger is served up on a paper plate with a nicely toasted bun, that’s slightly flattened, with wads of slivered lettuce dumped on a chewy chuck patty. Although the flavor of the beef is dull, the cheese is real and sharp and the pickles add a welcome cold snap. Onion rings are oversized salty and greasy. For a roadside diner burger, this is by no means the best in the world, but the colorful atmosphere that houses it is worth a gander. Ex-Piadina– now ex-Pop Art Bar and Restaurant, chef Salvatore Zapparata was a NO-SHOW at last night’s premiere opening event of Pop Art Bar and Restaurant on the Upper East Side, the evening was wrought with drama from the beginning, but somehow owner Nahid De Camillis pulled it off -cheffing the entire dinner herself lavishly decked out in a $5000.00 Oscar De La Renta couture gown. The restaurant looked stunning, with Mark Leialoha’s iconic rock images of Iggy Pop, Kurt Cobain and a never before published Michael Jackson peering down upon diners. The outdoor garden was low-lit and speckled in colorful floral arrangements, inside a offbeat artstic meets swanky uptown crowd moved around hobnobbing from table to table sipping Rosé, enjoying, and snapping pictures. Chicken Involtini-chicken rolled with prosciutto, celery, carrots served with potato, beets and tomato. Xi’an Famous Foods opens July 3rd-Named for the capital of the Shaanxi province in central China, this hole in the wall noodle den is branching out yet again, this time in kitschy St. Marks Place. Xi’an reached culinary noodle and burger stardom- with help perhaps, after Anthony Bourdain sung their praises on his show No Reservations “This place is unbelievable! 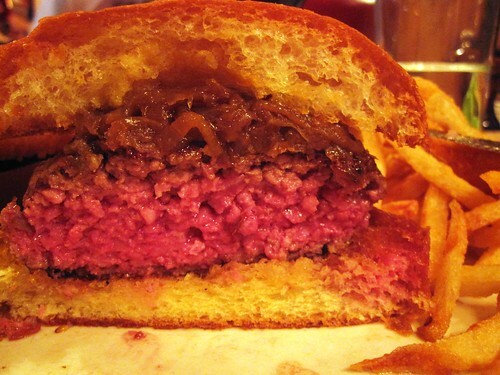 This lamb burger hits me right in the pleasure zone, great in any language or culture” says Bourdain. Along with the Cumin Spiced Lamb Burger, Xi’an also serves up Liang Pi “Cold Skin” Noodles, Stewed Pork Burger, Lamb Pao Mo Soup, and various types of Hand-Pulled Noodles. New York historic neighborhood, The Bowery has adapted to change and delivered many colorful stories throughout history, beginning in the 1600’s where the name was drawn from the Dutch word “bouwerij” for farm, to CBGB’s the city’s infamous den of punk rock and excess, to the restaurant suppliers peddling cookware on the sidewalks, and now today where sleek hotels and famed restaurants are cropping up it seems-every day. DBGB Kitchen and Bar– with the name a word play on the fore mentioned iconic muso haunt, is one of those spots that delivers a delicious and raucous sausage beer and burger experience. Daniel Boulud previously had a habit of establishing his niche in the culinary world with Uptown palatable institutions, Boulud now stylishly down markets his stable of eateries, with a glass, steel facade at the foot of a residential building in The Bowery. DBGB honors past culinarians with graffiti-like etchings and cookware memorabilia. The menu reflects his French roots, but focuses more on comfort and casual with an inventive element accented through exotic international flavors. Sausages, burgers and beer are the staples highlighting a banger pork fest with every kind of sausage imaginable, like the Toulouse [a pork, duck gizzard and garlic link served with cassoulet beans]; the Beaujolaise [a pork, mushroom, onion, bacon and red wine link with lentils du puy]; and the Tunisienne [a lamb and mint link with harissa, lemon braised spinach and chickpeas]. The burgers are equally inviting, with a trio of adorable names like The Yankee, The Piggie and The Frenchie which is stacked with a 6 oz. beef patty with confit pork belly, arugula, tomato-onion compote and Morbier cheese. The spacious restaurant welcomes you with a modern, sleek eatery style bar and brings you under a dark wood floor to ceiling shelves cluttered with copper pots and pans previously owned by famous food icons. I sauntered through the entrance of the dining room, inquisitively glaring for my favorite chef’s cookware. The dining room is sectioned in comfortable booths, with an open kitchen and server area that is dramatically playing alongside every diner. First on the tasting list for me was the Tunsienne, dark red sausage curled around a mound of rich braised spinach, the sausage was spicy and complex, but definitely smaller than expected. When I saw a Anthony Bourdain re-run featuring DBGB- where him and Frank Bruni snarfed away at sausage after sausage, they just looked bigger and fatter-but I guess everything does on TV. The Beaujolaise that followed was much larger and heartier than the Tunisienne, the symphony of pork flavors delicately played with the lentils offering a sweet and rich after tone. After several tankards of ale, the talk and mood at our table was loud and impatient as we waited for the twenty-something actor/foodie to deliver our Frenchie. Served up neatly on a peppered perfectly formed bun was this precisely constructed specimen of burger masterdom. Sitting in the middle of a sea of white porcelain the burger was flanked by crunchy cornichons and a flute of crispy well done French Fries, the bite was an eye-roller display of happiness-the bun was expertly toasted, and the bitterness of the arugula sweetness of the tomato compote teamed with pungent flavor of the Morbier made for quite the memorable bite. Pork belly definitely played a lead role in the taste and texture of this juicy burger; its ribbons of melted fatness glistened and erupted in the mouth with every bite. Interestingly, I heard that originally the Frenchie was sans cheese when it was first invented? Kudos to Boulud, for including the excellent Morbier. As an haute burger goes the Frenchie one of the hautiest! -Boulud is quite the culinary genius and let’s not forget, a businessman.